“You would have probably even laughed at us when we told you what our plans were for this particular property,” said Shaun Owens, Director for Strategy and Innovation for the USC SmartHOME Center for Economic Excellence. “I think now when you walk in the door, you’ll be met with a certain amount of promise,” said Owens. 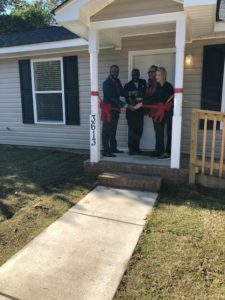 “[Homeowners will] be able to go through an app to turn the lock on and off,” said Kevin Wimberly, President & CEO of SC Uplift Community Outreach. “As well as the roll-in shower for someone who has the wheelchair to be able to go right into the shower,” said Wimberly. “Being able to provide this home where they’re able to age in place is just something that we greatly envisioned and we’re excited,” said Wimberly. “What we’re doing is creating technology and programs that are very easy for older adults to use regardless of how proficient they are with technology,” said Amelia Bischoff, with Telehealth at Palmetto Health. “With providers having busy, packed schedules, maybe not being able to fit patients in at the last minute, this provides a different avenue for patients to receive care,” said Dr. Christopher Gainey of Palmetto Health, as we interviewed him using the home’s Telehealth technology Friday. SC UpLift Community Outreach plans to build a similar project in the future. Eventually, they’re hoping to evolve this concept into a “smart village” community for seniors who qualify.